Coverage: Live coverage of eight games on BBC One and BBC One HD. Minute-by-minute coverage of all the home nations' games on BBC Radio 5 live and 5 live sports extra, BBC Radio Wales and Radio Cymru and across the BBC's digital platforms. Full-back Liam Williams and flanker Dan Lydiate are in contention for Wales places in the Six Nations opener against Ireland. Osprey Lydiate is back training after suffering a neck injury while Liam Williams (foot) played 60 minutes for Scarlets last weekend. "Everything's good with Liam and Dan Lydiate has joined back in," said Wales forwards coach Robin McBryde. Williams played the first hour of the Scarlets' defeat in Connacht on Sunday. It was his first appearance since limping off during Wales 15-6 defeat by Australia on 10 October. 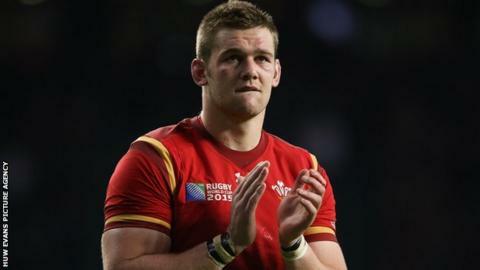 Lydiate was forced off during the Ospreys' New Year's Day win over Newport Gwent Dragons and has not played since. "Things went as well as they could for Liam," added McBryde. "He definitely won one collision (when Connacht wing Matt Healy was forced off through injury) and he was pretty secure under the high ball. "Difficult circumstances for him, but he's come through unscathed so whether he's fit enough to start an 80 minutes - he's certainly fit enough to play some part." Lydiate is not alone as a Wales back-rower short of match time. Captain Sam Warburton has played just once for Cardiff Blues in the last two months, against Calvisano on 22 January, because of an ankle injury. "I think we've got to look at each individual as to how much game time they need before they get back to full steam," added McBryde. "Sam Warburton doesn't need a lot of match time and he's straight back up there. "It's a discussion to be had with Dan (Lydiate). "The one thing we are seeing in a positive light is that Dan is taking part in our training sessions which are quite intense, and he's come through those scenarios okay, though it's not the same as a game." Warburton did not play for Cardiff Blues against Edinburgh despite saying he would like more game time after his comeback. "Warren just held him back," said McBryde. "It was hard to manage last week because we lost all the French and English-based players after the start of the week, which left us with 10 or 11 players for the Friday and Saturday session." Wales are due to announce their team to face Ireland at 1100 GMT on Wednesday, 3 February.